It's very unlikely that Peak Oil will sneak up on us unawares. Actually, the evidence suggests the opposite – that Peak Oil will be preceded by plenty of signals in the form of high prices and disruptions, and that we'll actually be well-prepared by the time it comes around. Why? Well, the main reason is the increasing demand from China and India (Chindia), which would cause price rises whether there was a geological problem or not. When demand increases at a faster rate than supply, prices go up. How far up? As a rough guide to estimating the price needed to confine demand to available supply, we have used an elasticity of 0.15 for global oil use. A 0.15 elasticity means that a 10% rise in crude prices lowers crude demand by only 1.5%. Taking today's roughly $55/bbl price as the benchmark, crude prices must rise to an average $61/bbl next year and to an average of $70/bbl by 2007 to achieve the needed demand cuts from trend. As those cuts begin to mushroom after 2007, so too must the price hikes required to bring them about. 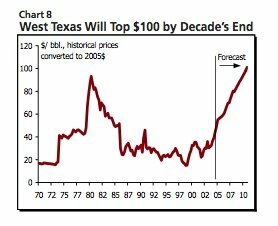 Crude prices need to rise to an average $80/bbl in 2008 and continue to rise to $101/bbl by 2010 (Chart 8). In constant dollars, those prices would represent the highest the world has paid for oil since the second OPEC oil shock, some forty years ago. 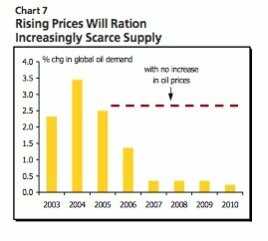 In other words, by the time that Peak Oil comes around in 2011, we will have had six years of continually increasing prices. This doesn't mean we're completely out of the woods, but it will slow India and China's demand growth, make tarsands and liquefied coal cost-competitive with oil, and give us plenty of time to build tramlines, adjust the economy and get back on our bicycles. The reduced global demand may also push the Peak back several years, and after that we may experience a similar plateau on the downslope (note that this is all consistent with the idea of a bell curve which flattens on either side of the Peak). Barring a terrorist attack on a pipeline or massive embargo from Saudi Arabia, sudden supply shortages are just not going to happen. If these figures are true, the only way that a country could just crash into a peak unawares is if it started nicking other people's oil and raiding its own reserves. This appears to be exactly what George Bush is trying to do: preserving the American way of life with a few more years of cheap oil while leaving the real problems until someone else is president. Fortunately it isn't working, and politicians will just have to come clean that they can't do anything about oil prices. 1) If Koppelaar and Leeb are right, then high prices will prepare us for a Peak long before there is an actual shortage. 2) If Colin Campbell's right, Peak Oil already happened in 2004 and nobody noticed. Which is even better. 3) If the cornucopians are right, Peak Oil won't happen until 2030, by which time we'll have fusion-powered personal spaceplanes and live on the moon. Which is better still. Good day John Denver, interesting that you are citating my report again. The final version is due to be released within 1.5 weeks with some publication in the Dutch media (maybe even television). So far the outlook until 2010 has become a little bit more pessimistic (slower growth rate) but the peak range has been pushed back (between 2012 and 2017 as opposed to between 2010 and 2015). I have added your link to the front page of our website (http://www.peakoil.nl/). Since i see this blog as a welcome addition to all the doom and gloom. (Although i often disagree with your standpoints). The question with your post above is mainly the decline rate. Is Type II and III depletion (whole fields and whole countries) going to be 4%? 6%? 8%? after the peak? I think Type II and III depletion lies around 2.4 mb/d which means a peak after 2010. Hi Rembrandt, thanks for dropping by. #154 was not written by me. It was written by Roland, the new contributor to POD. Looking forward to your final version. Why do you believe Type II and III is 2.4mbd? Hmmm from the sounds of things if the pessimistic geological prediction (2010) is right we will still make it. 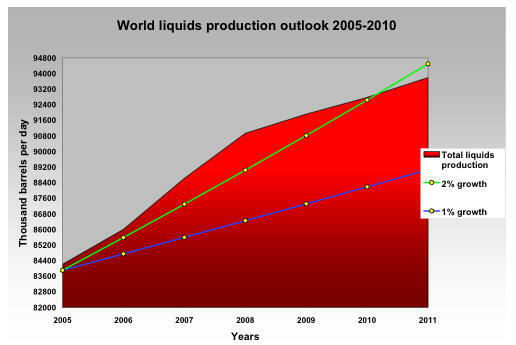 Who was it that was quoted as saying we'd "muddle through" peak oil? I think that may end up being a fitting description, it will be long painful and costly, but I think we'll make it. "If the cornucopians are right, Peak Oil won't happen until 2030, by which time we'll have fusion-powered personal spaceplanes and live on the moon." Anonymous #2 - I am pretty sure he was being ironic. Indeed. I think the message was "cornucopians are full of shite," not "we actually will have fusion-powered spaceplanes in 2030." What's the fishing like on the moon? I imagine this would further add to what I suggested in my article, i.e. an even longer period of high prices before the peak. That would also be the best thing that could happen because it will cause governments to get serious about the problem before it hits, and make people much more aware about oil. In fact I think this is happening already. Actually we may well have fusion-powered spaceplanes by 2030, but I think oil will have peaked long before! the 2.4 mb/d is based on decline estimates per oil producing country. I have no clue were Skrebowski got his numbers from.